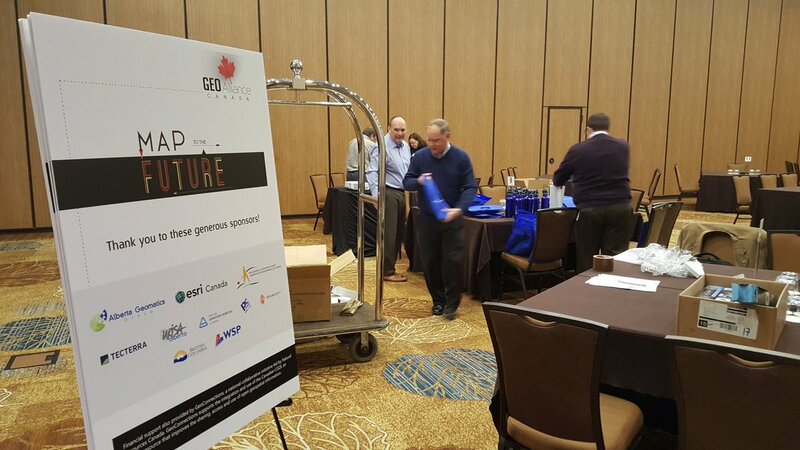 GeoAlliance Canada was pleased to host over 70 professionals for its inaugural meeting, “Map to the Future”, held in Calgary March 15-16 2016. Attendees represented a cross-section of the geography, geomatics and geospatial community across industry, education, government and non-profit organizations. They worked collaboratively to validate the GeoAlliance mandate, brainstorm opportunities, risks, and actions, and suggest specific projects that would benefit the entire geo community. The laudable efforts of the Interim Board of Directors of GeoAlliance Canada to bring the proposals developed by the Canadian Geomatics Community Round Table (CGCRT) to fruition were strongly supported by the community through attendance at this event and offers of financial support to make it possible. Attendees were welcomed to Calgary by Brad Ashley, Chair of GeoAlliance Canada’s Interim Board, who gave some context about the purpose of the event and the importance of capitalizing on this opportunity to begin development of meaningful, impactful projects to raise the profile of the geomatics sector. Brad spoke at length on the challenges this new organization has faced, from workload to cash flow, to the need to work collaboratively as a sector to ensure future growth. Our Keynote for the event was Dr. Alex Bruton, the Innographer, who spoke on the difficult and uncomfortable process of innovation, comparing it to learning how to ride a unicycle or “backwards bike”. He stressed that not every idea for creating a better industry will be a good one, meaning one that is both feasible and will have a high impact. He showed that for every 3000 ideas, generally only one will succeed. Dr. Bruton asked the attendees to think outside the box and come up with viable strategies for innovation within our industry and not be deterred by challenges or setbacks. The majority of the time over two days was dedicated to working individually or in small groups on worksheets provided by the event facilitators, Design Cofounders. The facilitators walked attendees through the process of first validating GeoAlliance Canada’s mandate by giving thoughtful input about the opportunities and risks it creates for individual organizations and the sector, and then brainstorming actions for the ways we can all take advantage of the opportunities while mitigating the risks. Attendees were given the opportunity to collaborate with other members across all sector segments (education, non-profit, government and industry) to develop potential projects for the community to undertake to address common goals and challenges. 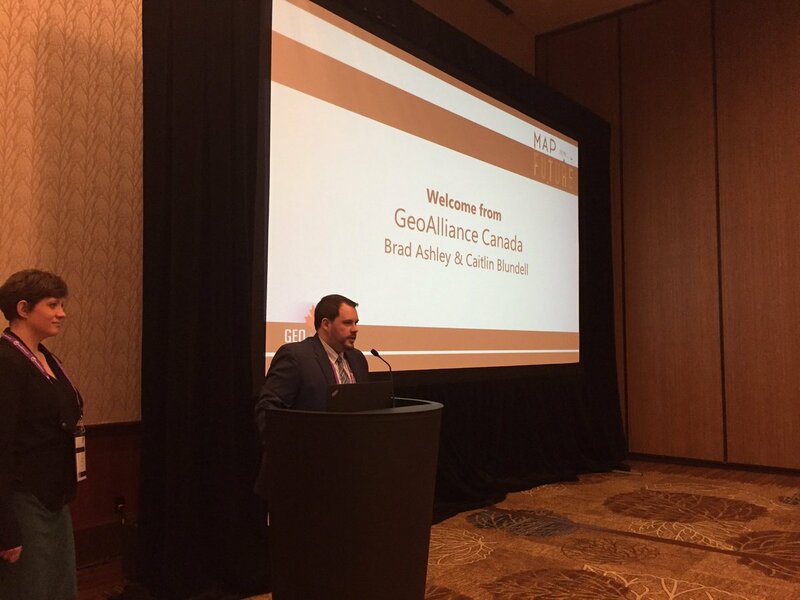 It was stressed that GeoAlliance Canada should be seen as a solution facilitator rather than a solution provider, and that their mandate is to help create conditions that support the success of projects undertaken by the geo community. To this end, the project concepts were self- and peer-evaluated for their desirability (are they for the good of the community? ), feasibility (likelihood of getting off the ground) and viability (likelihood of long-term success or sustainability). Several project concepts were presented to the room for feedback, and all project concept and evaluation cards were then collected for review by the GeoAlliance Canada Board. Additional project ideas will be collected through the GeoAlliance website in the coming months – it was reiterated frequently over the course of the event that this initial collection of projects is just the beginning, and certainly will not be the only chance to put forward a project for consideration. Further details about the work undertaken at Map to the Future are available here. The GeoAlliance Canada Board will take the outcomes, suggestions and feedback from this meeting and form an external project review committee reporting to the Board of Directors. This will allow for a transparent project pipeline, and the committee will include both members of our community and those in peripheral fields. This committee will assess incoming project concepts and work with the submitters to ensure the idea is shovel-ready, build strong teams, find additional resources as required, and help shepherd an idea from the concept stage through to a successful conclusion. As projects are funded and move forward, details will be provided on the GeoAlliance Canada website. Many thanks to everyone who sponsored, attended, or followed along on Twitter. Map to the Future was a first step for GeoAlliance Canada, and we hope we will look back on it as a leap forward for our community. While the work to define and implement meaningful community projects has begun, further investment by willing partners will be required to bring them to fruition. Those who participated in the Calgary meeting demonstrated an interest and willingness to make this fledging new organization a success, but GeoAlliance Canada will continue to grow and evolve. We look forward to working with our members and the Canadian geo community to build bridges, collaborate, and promote our work across Canada and on the world stage.